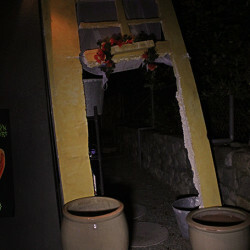 The Opechee Way Haunt is a home haunt located in the hills of Glendale, California. 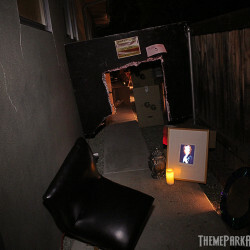 Tucked away in this quiet, cozy neighborhood, Sam Kellman and his spooky cohorts have been creating the home haunt for the past several years. What sets Sam aside from your average haunter is that he’s 12. 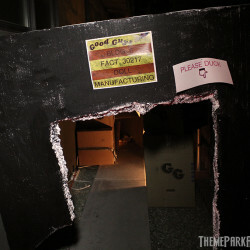 His team of fellow haunters are also pre-teens that have an incredibly strong sense of staging and production. 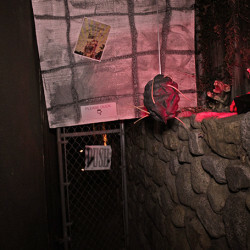 2014’s presentation of The Opechee Way Haunt was subtitled The Sum of All Scares, and featured small sets and scenes constructed and arranged around the perimeter of Sam’s home. 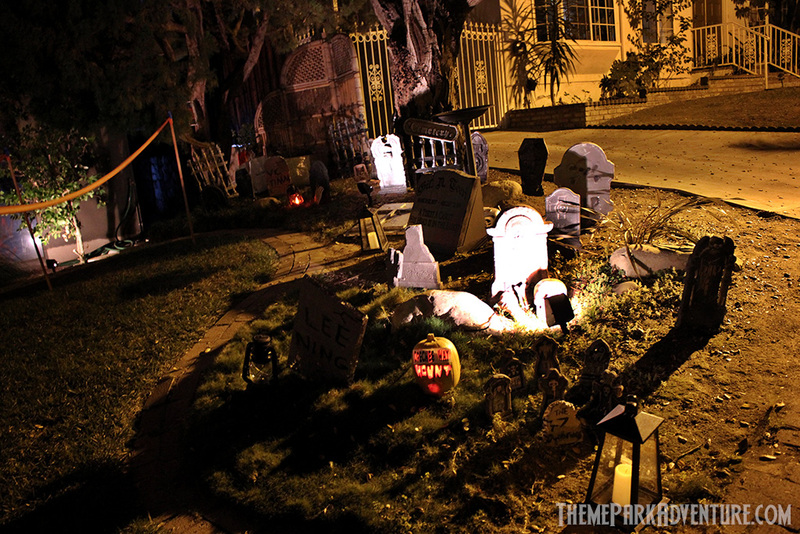 Small groups are let in at a time; the attraction is pulsed, and those waiting do so in a professional switchback queue that is set up on the home’s driveway, next to a makeshift cemetery filled with leaning tombstones and glowing Jack O’Lanterns. 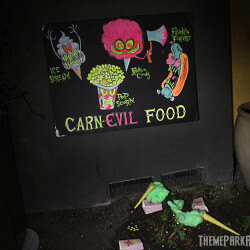 We visit all types of home haunts during the Halloween season. 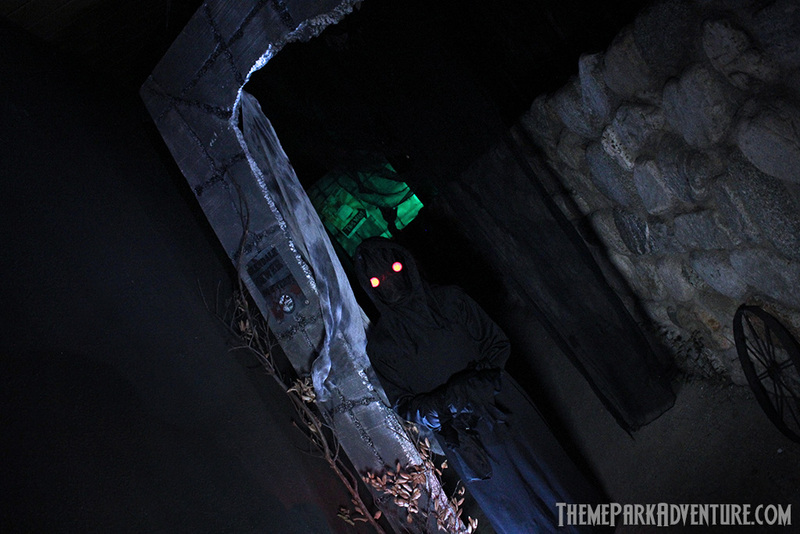 Sam reached out to us and asked if we had time to come by and see his own haunt, which isn’t unusual at all. 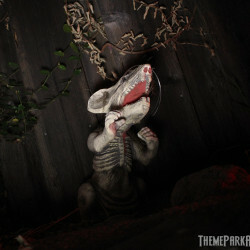 The thing that caught our attention right away, was when he disclosed how old he is, and that the haunt is mainly put together by he and his friends. It’s not often that a pre-teen contacts TPA and is so confident and well-written about a project such as Opechee Way Haunt. 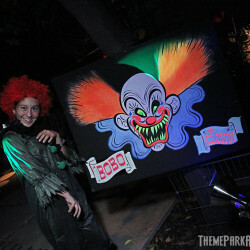 Opechee Way Haunt isn’t elaborate or over-the-top, as many home haunts are here in Southern California. 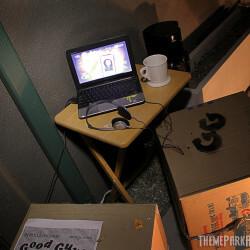 It’s a lo-fi experience that reminded me of haunted houses I used to create with my own pals when I was a kid. When we went to Glendale to pay Sam and his team a visit, we didn’t know what to expect, honestly. As we pulled up, we noticed the gang in the front of the house, setting up a switchback queue; that’s the first thing that struck me. Going through the haunt, I was floored by the team’s sense of staging and the honest effort they put into it – from the physical sets to the acting; they really poured their hearts and souls into this production and I found myself so incredibly impressed that I must have looked like a grinning fool the entire way through! Sam was definitely calling the shots while we were there; he and the team took our visit very seriously, and they rose to the occasion and put on a tremendous show for us! In a region where home haunts rival theme park productions tech-wise, it was really touching and charming to me to see this group of kids (and I hate that term, because in this case, it sounds derogatory – but it’s not; they are kids – damned smart and mature ones) really having at it with gusto and enthusiasm like the Opechee Way Haunt gang does. 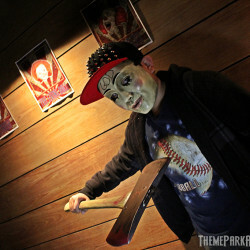 The Opechee Way Haunt had multiple themes, which were spread out over its different scenes, including a scary clown carnival, and a Tower of Terror-like environment. Oh, and an axe-wielding maniac at the end to finish it off! I’d be remiss not to mention the axe-wielding ghoul! The haunt had a great sense of show – with a beginning and a frightening end, and a whole lot of haunted house goodness in the middle. We deal with a lot of haunters; not just at Halloween time, but throughout the year, especially since we help produce ScareLA each summer. 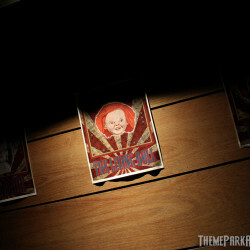 I know the theme park teams, the ridiculously talented home haunters, and just about everyone in between. Seeing this group behind Opechee Way Haunt, I couldn’t help but be taken aback by the fact that with them, I am literally witnessing the next generation of haunters coming up here in Los Angeles. That is terribly exciting and special to me. 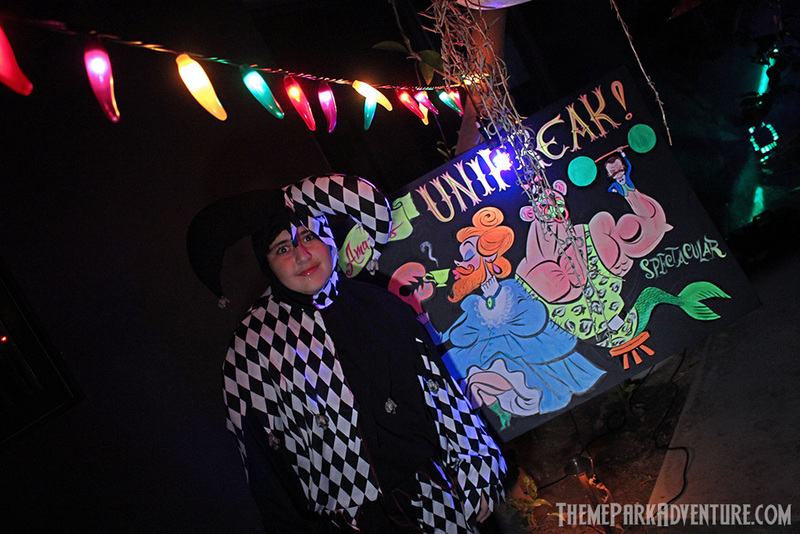 Because of that, Opechee Haunt was one of the highlights of Halloween 2014 for Theme Park Adventure. 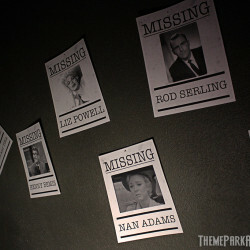 Anyone can buy props, and anyone can throw masks on and turn off the lights. Haunts are so mainstream now, that just about anyone can put together something decent with some dedication and a bankroll. 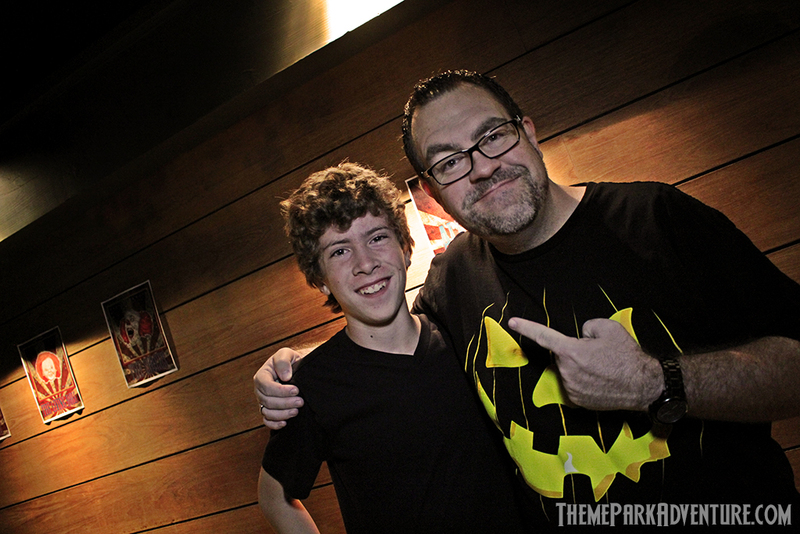 Knowing that Sam and his friends had very little to work with, and that they constructed a really thoughtful home haunt experience as a team – I love that so incredibly much! 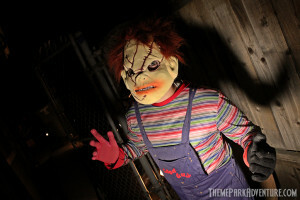 Theme Park Adventure will definitely visit Sam and the Opechee Way haunters for as long as they continue to make scary magic here in Los Angeles. I personally cannot wait to see what comes next for them, and know that Sam is already turning ideas over in his head about Halloween 2015. 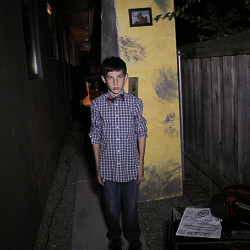 This isn’t the last we’ve heard of Sam Kellman or The Opechee Way Haunt. Just like so many great and well-known haunters before him, he’s starting small at home, and it’s just going to get better each year as he grows and finds his way. We look forward to continuing to tell that tale in the years to come. When you do stop by, tell them you found out about them on TPA! 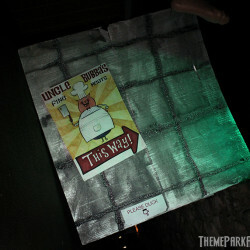 This entry was posted in Haunted Attractions, Home Page, Home Page Slider and tagged Sam Kellman, The Opechee Way Haunt. Bookmark the permalink.